Call me naïve, or stupid, but apparently BLAZE BAYLEY is a big deal among some Hard Rock / Heavy Metal fans. But I guess, there is always time to educate yourself. So earlier this year, the ex-IRON MAIDEN vocalist/band released their 6th full length and the 3rd instalment in the “Infinite Entanglement” series through their own S/T Record label, and by the looks of the album art, it looks impressive so far. “Redeemer” starts off with a female voice narrating a plan of conspiring to make a woman guilty of a murder, before the background music grows in tempo and Blaze Bayley takes the center stage to take you into a journey that the fans of the band have known for long. The unique clean vocals add so much newness and variety to the band, no wonder the band is held in such high esteem. The guitar and drum work is clean and the solos don’t sound out of place or forced as well. “Are You Here” talks about a destructible machine that can bring doom to humanity and how man I struggling to cope with the dominance of machine over himself. “Immortal One” is a song about 3 golden angels and has a smooth melodic feel to it, amidst the long story driven lyrics. “The First True Sign” is a song about a symbolic shining star and how to overcome adversities by not succumbing to our emotions. “Human Eyes” is a song about all the dark stuff that our eyes sees and the moral reality of pain, death, hate and other emotions and reality. “Prayers of Light” drives a message with its inspiration lyrics of never giving up even during your worst times. “18 Days” sounds more like a poem turned into a song here, really beautiful lyrics and great music too. If the lyrics doesn’t melt you down, the guitar solos surely will. The pale female backing vocals adds to much beauty to the already beautiful music here. “Already Won” is a shorter 2 min song, but is still impressive on its own. 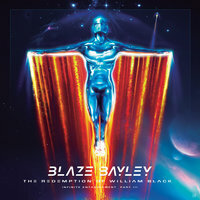 “Life Goes On” is the 1st BLAZE BAYLEY song that I had ever heard and the lyrics are so infectious, addictive and hummable. “The Dark Side of Black” is a much pacier track that has more inspirational lyrics that I think one can add to their gym workout playlist. The album ends with an 8 min song in “Eagle Spirit” that again talks about a symbolic star and more depressive stuff amidst very melodic music, driven by sharp guitar work. It’s a song calling for people to stand up and fight when their lives have been ruined by somebody else. An 8 minutes of emotions and great musicianship. As I haven’t listened to the previous two albums in the trilogy, this one sounds off from a thematic lyrical point, but on its own, “The Redemption of William Black” is a great album. Fans of U.D.O, JUDAS PRIEST, ACCEPT, IRON MAIDEN should be right at home with this album.